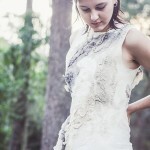 Create beautiful accessories using natural materials including natural linen and flax fibres. 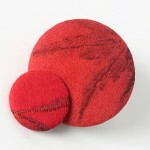 Enjoy linen’s natural colour, texture and design your own one-off and personalised accessories. 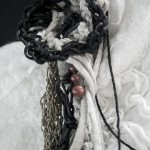 • Explore and experience versatile nature of linen threads and fibres and their applications in art wear and accessories. • Combine and fuse linen, paper and linen fibres to expand the design’s potentials. • PLAY with linen ! 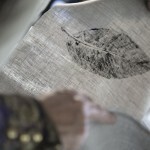 CREATE with linen ! 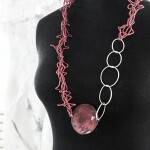 WEAR your linen art ! 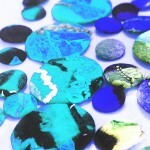 All materials provided, however additional materials to add extra details to your design can be purchased on the day. 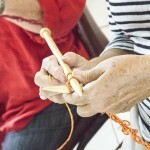 Participants are asked to bring crochet hooks and knitting needles if they crochet or knit (not essential). A notebook, pens and pencils and a camera are also useful. Enjoyed myself immensely. Challenged me to think outside the box! It was great to play with all the different textures. Thank you for challenging me and also for the opportunity to de-stress! Enjoyed the class very much! The background on linen was most informative. 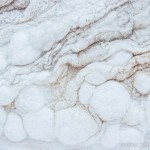 The variety of materials extends your ideas. The teaching was excellent and easy to understand, especially for those for whom the course was new and who had done nothing in this line. Jola’s thoughts and ideas were very welcome and encouraging. 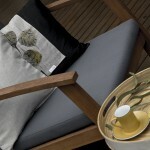 Create beautiful home accessories using natural materials including natural linen and flax fibres. Enjoy linen’s natural colour, texture and design your own one-off, botanically inspired accessories or giftware, just in time for Christmas Season. Explore and experience versatile nature of linen and its diverse applications. Be inspired by your garden, local park species or memory of your childhood garden. 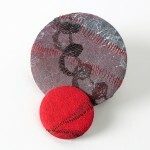 PLAY with linen ! 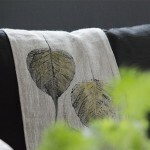 CREATE with linen ! LIVE with your linen art ! Good enough to eat? Good enough to dye with! 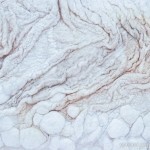 Introduction to natural dying techniques focusing specifically on edible plants. The workshop explores different effects Australian Native plants and edible dyes create on a range of natural fibres, merino jersey, felt and silk fabrics. The samples produced can be applied in one-off art wear, home decor and textile finishes to create harmonious, toxin free, ecological living environment. All materials supplied. 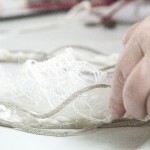 Explore and experience versatile nature of the linen threads and fibres. Get to know the linen, its unique characteristics and unlimited potential while creating your own accessories. 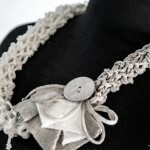 Enjoy linen’s natural colour, texture and design your own one-off jewellery piece. 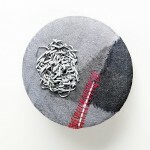 Combine linen, paper and wire to expand the design’s potentials. Add a touch of wool or silk and have your true natural fibre accessory suitable to wear all year around…All materials supplied for 2-3 designs. PLAY with linen ! 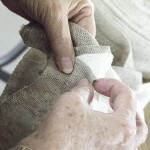 CREATE with linen ! 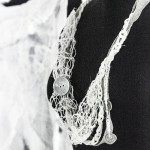 WEAR your linen art ! 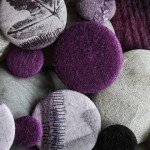 Introduction to felting techniques including surface design and embellishment. 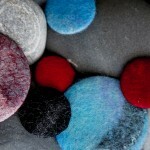 Explore different natural fibres and their applications in art wear, home decor and other felted forms. All materials supplied. Workshop Content:Excellent, I liked the way you provided context and information about fibres, in addition to the info we needed to complete the actual task. Workshop delivery: Confident, experienced and accomplished. It is clever that you showed us the dresses, because now I want to make one of them. Teaching style: Friendly, engaging with timely attention when needed. 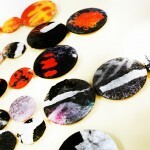 The workshop focuses on creating a surface design suitable for a collection of textile accessories (brooches) in 3 different sizes to allow different composition and mix and max approach to suit the person’s needs. 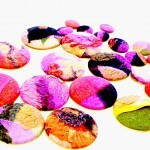 The technique will draw on 2D felting skills, colour design, surface design and embellishment. 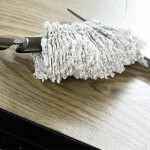 No prior felting skills are required and all materials supplied. PLAY with fibre ! 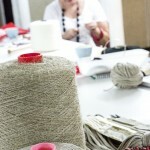 CREATE with fibre ! 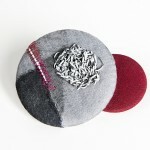 WEAR your fibre art !